Buy One, Get One 50% Off on Select Funko! Demon to some. Angel to others. This vinyl figure is a real hell-raiser - literally! 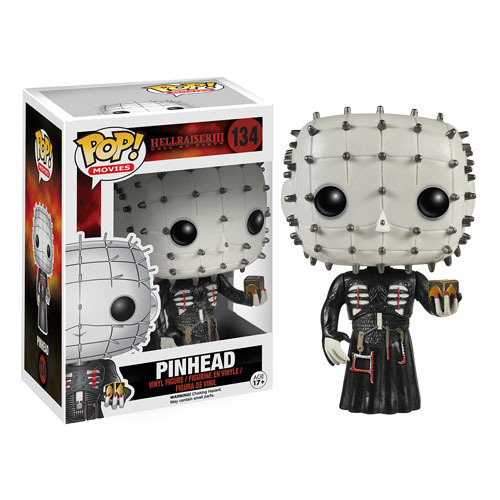 Cenobites leader Pinhead from the Hellraiser movie series is back again as this stylized 3 3/4-inch tall Hellraiser Pinhead Pop! Vinyl Figure. If you have the courage, take him home. Ages 17 and up. Addams Family Morticia and Gomez B&W Pop! 2-Pack - EE Excl. "I thoroughly enjoy shopping here. The sales staff are out of of this world. Their customer service is impressive. A wide range of difficult to find and one of a kind items." "I thoroughly enjoy shopping here. The sales staff are out of of this world. Their customer service is impressive. A wide range of difficult to find and one of a kind..."